Calling Back a Zombie Ship From the Graveyard of Space, New York Times (front page story!)\n\n\"Mr. Wingo has now persuaded NASA to use the Deep Space Network to pinpoint ISEE-3's trajectory, to calculate the rocket burn required to put it on a path to Earth orbit. Dr. Farquhar's 1986 calculations were close, but not exact. Slight errors are magnified over time, and now the uncertainty is 20,000 miles, which means the spacecraft could be on course to splat into the moon. \"It is in the agency's best interest to find out, one way or the other,\" Mr. Wingo said. 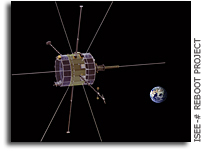 If everything goes as hoped, ISEE-3 will end up in its original location to observe solar wind, fulfilling Dr. Farquhar's promise to return the spacecraft.\"\n\nPrivate Team Delays Engine Restart for 36-Year-Old NASA Probe, Space.com\n\n\"NASA has given approval so far for the ISEE-3 Reboot Project to speak to the spacecraft until June 25, but Cowing said he has every confidence the window will be extended. Then, when the spacecraft is ready, he has some big plans for outreach -- including a website where people can get near-real-time information on how the spacecraft is performing. \"We will have an online presence on the spacecraft that rivals NASA's\" or is even better, Cowing said, adding he will announce partners on the project when the time is right.\"